Last October, the Environ-mental Protection Agency (EPA) strengthened the National Ambient Air Quality Standards for ground-level ozone to 70 parts per billion (ppb), down from 75 ppb, in an effort to further protect public health. As the St. Louis area settles into its first air quality forecasting season highlighted by these stricter standards, the region is bracing itself for the possibility of more poor air quality days this summer than in recent years. With the updated standards top of mind, the Clean Air Partnership is ramping up its efforts to encourage area residents to check the daily forecast to protect their health, and to do their part to help reduce emissions to keep air quality in the healthy range. Since transportation has the most profound impact on air quality, making the choice to spend less time behind the wheel is an easy way to reduce the emissions that lead to poor air quality. Actions like using transit, carpooling and vanpooling, choosing not to idle your vehicle, combining errands into a single trip, walking and biking more, telecommuting and/or adjusting work hours, so you can stay off the road at peak commute times, all help take cars off area roads and the related emissions out of our air. These actions are especially critical when poor air quality conditions are in the forecast. In addition, there are many eco-friendly lifestyle changes that can further positively impact air quality, including efforts to conserve energy, recycle, reduce waste and reuse items. “While weather conditions play a big role in our air quality, there are many things we can all do to reduce emissions, and those efforts continue to be critical to our health,” noted Fuchs. 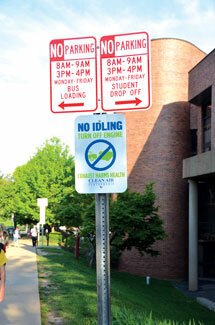 Throughout the summer, area residents are encouraged to visit the Clean Air Partnership’s newly updated website at www.cleanair-stlouis.com, which features air quality information and tips to help area residents do their share for cleaner air. Visitors can sign up there to receive the daily forecast via email. Individuals can also find additional air quality information and the daily forecast on the Clean Air Partnership’s Facebook page or follow the organization on Twitter @gatewaycleanair for daily updates. This entry was posted on Wednesday, June 1st, 2016 at 3:59 am and is filed under June 2016. You can follow any responses to this entry through the RSS 2.0 feed. Responses are currently closed, but you can trackback from your own site.